Landscapes have always been popular with artists as well as collectors. And today, they are as popular as ever, because they let us look back to a time before the surfacing of the modern world. Through these artistic interpretations, we’re able to revisit a time that no longer exists, except through paintings and tapestries of artists who captured these moments for eternity. “Ivy Column” is a classic example. In it, we see a garden in summer’s full bloom. In the distance, a charming country house, bathed in the sunlight. A pond welcomes us in the foreground, surrounded by flowers in bloom. And just beyond them, the true subject of this work of art, an ivy covered column. “Ivy Column” will look great in any home, but especially one rich in old country charm. 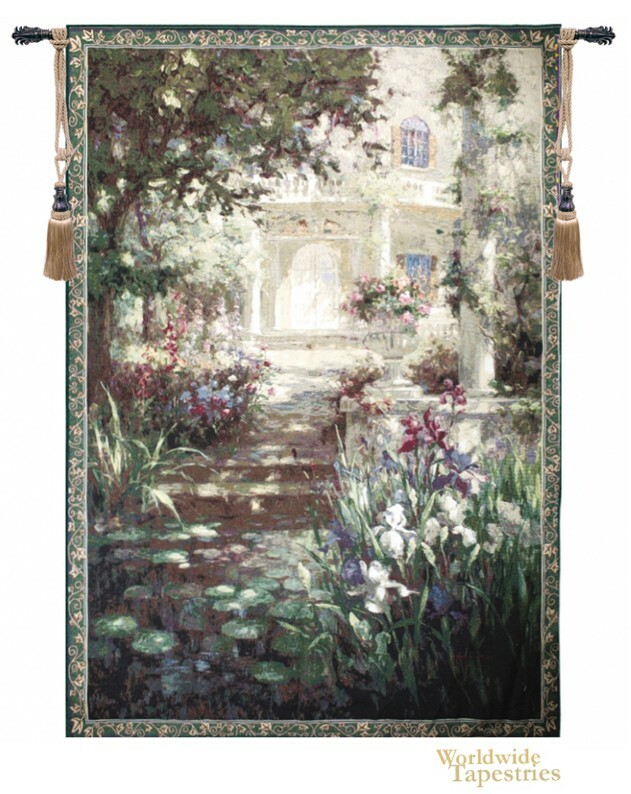 This tapestry is lined at the back and has a tunnel for easy hanging. Note: tapestry rod and tassels, where pictured, are purchased separately.